The Easyboot Edge is ready to rock! I did a ride tonight in the Edge and Glove. The Edge has had a couple last tweaks and it is now ready for release. 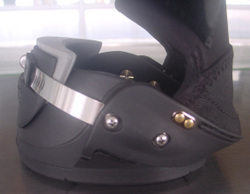 I really like the Edge and especially like the fact that we have eliminated cables and buckles in this hoof boot design. In the last year of testing the Edge, I have yet to have the worm clamp at the front of the Edge fail. The improved tongue system has new materials and excellent shock absorption qualities. I've had many questions in the last couple weeks regarding what boot to choose. "EasyCare has several great looking new boots. Why would I choose an Epic or Edge over a Glove?" "Why would I use the Glue-On instead of the Glove?" These are great questions and ones that I'll answer below. I believe the Easyboot Glove is our best boot for several reasons. It's close fitting, lightweight, low profile and the sleekest non glue-on hoof boot available. In addition it's our easiest boot to apply and remove. Best of all it has an affordable MSRP of $56.00. If your horse has a foot that fits into the Glove these are the boots I recommend. Your first step should be to order an EasyCare Fit Kit. If you have success with the Fit Kit order the Easyboot Glove. If your horse is not a candidate for the Easyboot Glove based on the results of the Fit Kit I would recommend either the Epic, Edge, or Bare. The Epic, Edge, and Bare are more adjustable than the Glove and can accommodate feet with more challenging hoof shapes and angles. The Epic is our most tested product and has tens of thousands of successful miles. The Epic has been and will continue to be one of best selling products because it works so well. The Bare is also tested but a boot suited to more advanced users. The Edge is probably the easiest to apply and I believe will have similar results to the Epic. The Easyboot Glue-On is a great boot for the multi-day endurance riders and 100 mile events. It's also great for people who want to put boots on for many days at a time and not mess with daily application and removal. Great for back country pack trips. In addition the Easyboot Glue-On has many therapy applications and can be used with impression material for extended periods. 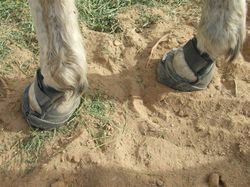 Because it's very difficult to see if a horse is even wearing the Easyboot Glue-On it's perfect for competive trail organizations with rules that prohibit boots that extend above the hairline. Worried about doing dressage in boots, you can't even see these boots and your horse will never move better. I did a couple shots showing a 360 degree view of all our new products. Take a look at the new Easyboot Edge and Easyboot Rx in a 360 degree view. Christoph and Moon finished 3rd on the final day of Las Cienegas. Moon was fitted with 4 Easyboot Glue-On shells. I was originally scheduled to ride Spyder the last day in the Easyboot Edge but I decided to head home and spend my Sunday with Alyxx. Only so many hours in a day and the new boot designs accomplished great things the first two days. Family first! I've been away from the sport of endurance for several years and have a bunch to learn. Christoph and Dian were awesome teachers at the ride and I got a mini endurance clinic over the weekend. I learned a bunch about electrolytes, feed, supplemens, new saddles, tack, pacing and training techniques. If anyone is looking to learn more about endurance, lease a horse or purchase a good endurance horse I would recommend checking Global Endurance out. I continue to put more miles and time on the Easyboot Glove. The Glove continues to excel and pass all the tests with flying colors. 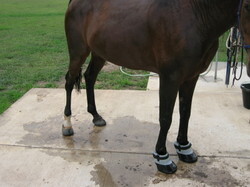 It's EasyCare's best hoof boot! I'm amazed at how well it works and how easy it is to apply and remove. I did 3 hours of tough riding last night and an additional 2.5 hours on another horse this morning. 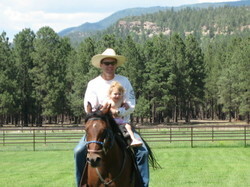 I'm getting a couple of the horses fit for some endurance events in 2009. Can't wait to see how they perform at 50+ mile distances. Here are a couple photos from the ride. Easyboot Edge up front, Easyboot Glove in the back. Everyone at EasyCare has been working hard on our product line additions for 2009. I'm personally really excited about the new boots and have been impressed with the testing results over the past several months. The Easyboot Edge will be a great trail and distance boot. It opens wide for easy fitting and removal. Cables and buckles have been eliminated for a more streamlined fit. 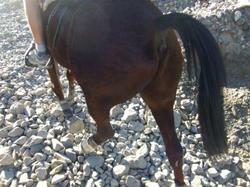 The Easyboot Glue-On has been designed for endurance riding or multiple day back country trips. 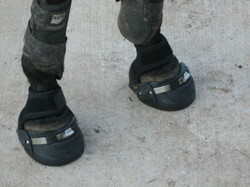 At less than half the weight of a standard Easyboot the Glue-On will be the most streamlined and lightweight hoof boot. The Easyboot Glue-On with Gaiter gives you the ability to use the Easyboot Glue-On shell with out glue. By quickly attaching a gaiter to the shell, the boot now functions as a great trail and endurance boot. Very form fitting and streamlined fit. No cables, buckles or straps. The Easyboot Rx takes EasyCare in a new direction and toward the veterinarian market. The Rx will be marketed as a therapy boot. It provides support and relief for horses suffering from chronic lameness, laminitis, founder, navicular and other lower limb/hoof problems. The Easyboot Edge is about done and will be going out to our Team Easyboot members soon for additional testing. We have put a great deal of time and effort in both selecting and testing the correct pad material for the tongue. We were not happy with early test results but have found some materials that make the Edge function extremely well. The Edge "EasyKey" is also complete and makes install and removal quick and easy. The big differences between the Edge and Epic are below. 1. Edge has no cable. The cable on the Easyboot Epic can fray over time. 2. 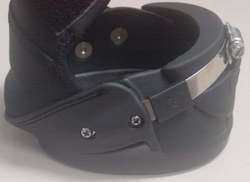 The Edge buckle system is very low profile and eliminates interference. 3. The Edge has no internal hardware. 4. The Edge opens much further for easy application and removal. I had a good day testing products and was actually able to test two Easyboot Glue On boots, two of the new Easyboot Edge's, our new No Thrush solution, and two EasySoakers. 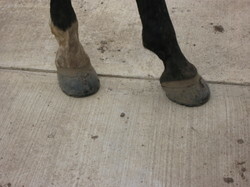 The biggest trick to any glue on hoof boot is getting a good bond with wet conditions. It's easy to glue on boots in a dry environment but moisture makes the gluing much more difficult. We had a big storm Sunday night and everything was wet. The horses feet were muddy, the grass was wet and I even left the glue on shells in the rain the night before. I figured it would be a great time to test some new gluing techniques. I took Baja on a pretty difficult ride this afternoon fitted with the two glue on boots fitted Monday morning and two Easyboot Edges on the front feet. We did 2 hours up a very steep trail that climbs 2,500 feet over 5 miles. 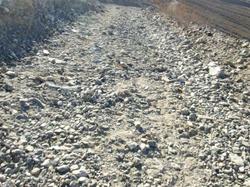 I believe the constant strain and torque when climbing steep grades is what dislodges most glue on shells. After the ride I soaked the front feet in our new No Thrush solution. I've been seeing some signs of thrush and have started soaked feet once per week. The more and more I learn about thrush the more I believe that weekly soaking should be done by most all horse owners. The last Pete Ramey clinic I went to I remember Pete saying that he believed that more than 90% of horses were affected by thrush. The Easyboot Edge was put on hold for a touch because we wanted to test some alternative materials in different areas of the boots. It's taken a bit of time to get the densities correct but I think we are just about there. Last week I rode all 4 of our horses in the latest design and was very happy with the results. We have updated the design on all Easyboot Epic, Easyboot Bare, Easyboot Grip and Easyboot Edge gaiters. The new design has elastic at the back of the gaiter instead of leather and allows the gaiter to be folded backward before application. 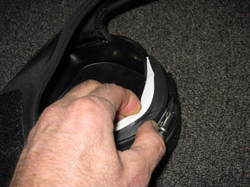 With the gaiter folded backward the boot is much easier to apply. 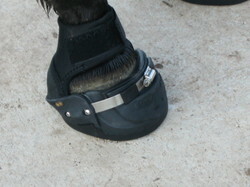 In addition to making each hoof boot design easier to fit the elastic stretches and gives to fit each horse better. Here is a short video clip showing how the gaiter folds backward. I just got an e-mail from a friend from Tasmania. 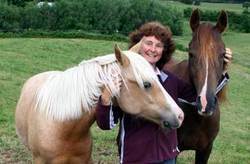 Cynthia Cooper has a nice website that covers natural horse care and "Good Horsemanship". The Naturalhorseworld website has a great list of resources and articles. Check out the January Newsletter and some tidbits about the new Easyboot Edge. The patent work is complete and I can now show you the latest on the Easyboot Edge. We have been working on a soft, conforming, hoof boot comfort system that will be located in both the front and sides of the Easyboot Edge. 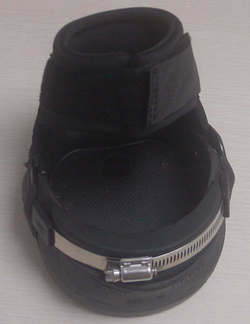 The hoof boot comfort system has cushioned inserts that fasten inside the boot. The inserts are designed to act like a gasket and provide a custom fit for each hoof. 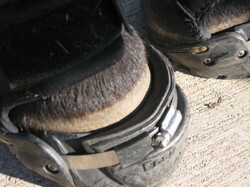 This important design feature helps the boot conform to different hoof shapes. The custom fit helps keep dirt and debris out of the boot and helps provide a snug fit. In addition to providing a custom fit, the inserts add a great deal of cushioning and comfort. The current density on the inserts is similar to an EasyCare comfort pad. We are experimenting with different densities and dual densities. All inserts are removable and replaceable. The photos below show a dual density version of the tongue insert. The white area is slightly softer than the black area. The third and fourth photos show a single density version. I just received a bunch of e-mails and photos from Karen Chaton. The Death Valley Encounter is now over and the first major public test for the Easyboot Edge is complete. Not only did the Easyboot Edge pass but they were used by several horse and rider teams to complete every mile of the demanding trail. Take a look at these photos. We have some small tweaks to make to the design but after 200 miles of this type of trail we are excited about the Edge and the testing results. 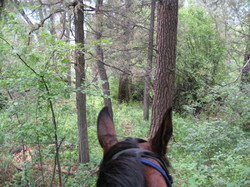 How do non padded and non booted horses do this type of trail for 200 miles? I just received a voice mail from Karen Chaton regarding the results of the first day at the Death Valley Encounter. The news was great! 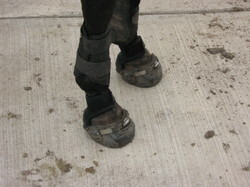 We had 10 of the new Easyboot Edges on horses that completed the first 50 mile day. All horses using the new Edge finished in great shape and all boots performed well. All boots stayed on, no broken boots, no gaiter issues and no rubbing. Here is a photo of Chief during the first day of the DVE fitted in the Easyboot Edge. The Easyboot Edge will be used by several riders at the Death Valley Encounter multi-day 200 mile endurance ride Dec 28, Dec 29, Dec 30 and Dec 31. Although the Edge has been under development since early 2007 this weekend will be the first major test in a public environment. Our goal for the weekend is to have the Easyboot Edge perform at the 50 mile distance for multiple days. 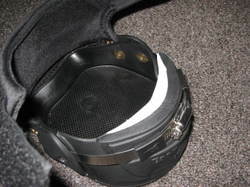 The Easyboot Edge is the first boot in the EasyCare range to use a worm clamp closure system. Our testing of this concept to date is very, very promising. The worm clamp system is very low profile, allows for precise adjustments and has been very durable in the harsh horse environment. The Edge is free of inside hardware. 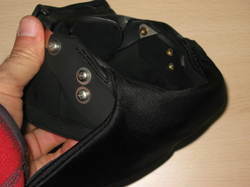 The hoof boot does not have an inside strap or taper straps. 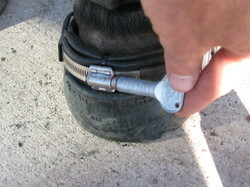 This allows the shell to conform to each hoof as the worm clamp is tightened. 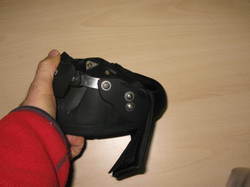 The Edge is fitted with a gaiter that is similar to the new gaiter designs that will be shipping with the Epic, Bare and Grip in February 2008. Although many of the improvements below look simple they significantly improve the performance of the gaiter. We have completed all the provisional patent work to protect the designs and manufacturing techniques. The new gaiter design has four major improvements. 1. 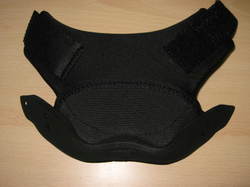 The new gaiter design has no internal stitching. 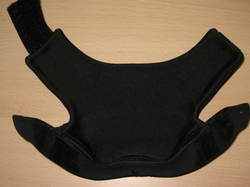 All stitching on the inside of the gaiter has been removed making a softer and less abrasive surface for the horse. 2. All edges on the gaiter are now rolled. Top, bottom and sides. 3. 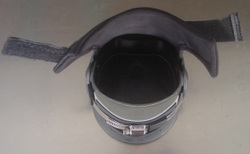 The leather on the back of the gaiter has been replaced with a two way elastic. This two way elastic stretches and gives to accommodate different heel builds. 4. The elastic at the back of the gaiter also makes each boot much easier to apply. The gaiter can now be folded back over the boot out of the way during application. Introducing the NEW Easyboot Edge! The new EasyCare hoof boot officially has a name!!! Introducing the Easyboot Edge! We received so many names (1,589 in all!!) it took us some time to narrow the list down to a name suitable for this great new boot. If everything goes well we'll be launching this new boot sometime around the first quarter of 2008. We look forward to updating you on the status of the Easyboot Edge!